Worldwide spending on the Internet of Things (IoT) will jump up 14.6 percent in 2018, reaching $772.5 billion, according to the latest report from International Data Corp. 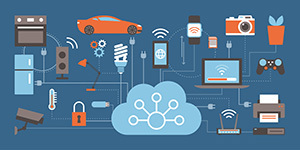 The market research company's Worldwide Semiannual Internet of Things Spending Guide forecasts sustained growth for the category, at a compound annual growth rate (CAGR) of 14.4 percent all the way through 2021 — ultimately reaching $1.1 trillion. IoT hardware, such as modules, sensors, infrastructure and security, is expected to account for the largest portion of spending, hitting $239 billion in 2018. Services will come in second, followed by software and connectivity, the IDC report said. Software and services will be the fastest growing segments, at five-year CAGRs of 16.1 percent and 15.1 percent, respectively. "By 2021, more than 55 percent of spending on IoT projects will be for software and services. This is directly in line with results from IDC's 2017 Global IoT Decision Maker Survey where organizations indicate that software and services are the key areas of focused investment for their IoT projects," said Carrie MacGillivray, vice president for Internet of Things and mobility at IDC, in a statement. "Software creates the foundation upon which IoT applications and use cases can be realized. However, it is the services that help bring all the technology elements together to create a comprehensive solution that will benefit organizations and help them achieve a quicker time to value." According to IDC, the industries that will spend the most on IoT in 2018 are manufacturing, transportation and utilities, with consumer spending coming in fourth. In addition, cross-industry spending will be a major factor: "Cross-Industry IoT spending, which represent use cases common to all industries, such as connected vehicles and smart buildings, will be nearly $92 billion in 2018 and rank among the top areas of spending throughout the five-year forecast," IDC said. The Worldwide Semiannual Internet of Things Spending Guide analyzes global IoT spending for 14 technologies and 54 use cases across 20 vertical industries, including government and education. For more information, go to the IDC site.